I was interested to hear of Cerner’s formation of an Advisory Group “to provide insights and recommendations in support of Cerner’s work” on the VA EHR program. Although it’s “comprised of distinguished former government, military, and private sector leaders sharing a common interest in Veterans health and wellness,” it’s lacking any “regular” veterans. My former hospital was very progressive in having patients represented on a variety of steering committees and project teams – sitting right alongside the CEO, hospital board members, department chairs, service line directors, and other stakeholders as we made a variety of decisions that impacted patient care. I didn’t fully understand the gravity of having patients (and their caregivers) on those committees until I experienced it myself. Staring a patient in the face while making difficult decisions about EHRs and the management of patient data is very different than making the decision in a room of IT experts. Even though there are distinguished veterans in the group, I would submit that the electronic health needs of the “average” veteran are different from one who is a former Senator/Governor; even though Senator Kerrey does have experience receiving care in the VA system. My local VA is seriously challenged with leadership turnovers, staffing issues, and poor patient care experiences that our veterans do not deserve. Let’s get some patients in the room and see what a difference it makes as Cerner works to move their care forward. Speaking of patients, just a reminder that all of us will be patients at one time or another. Let’s avoid being patients with influenza – the vaccination season has already started. The CDC website has information on projected strains – my employer requires all staff members to receive a vaccination by the end of next week. The best part of being vaccinated during my last patient care shift was watching my staff decide who was going to get the short straw and have to play “pin the vaccine on the physician.” The worst part was realizing several hours later that my band-aid had fallen off and I had bled through my scrubs and white coat, probably causing patients to wonder what was going on with my arm (although no one mentioned it). The paramedic who administered my vaccine was horrified, but accepted my explanation that it was much more likely due to the daily aspirin I’m taking rather than her technique. CMS released a new fact sheet that covers mass immunization events and so-called roster billing. Most of my experience has been with traditional office-based immunizations, but I always enjoy learning something new. Definitely something to think about for organizations who provide mass-immunizations and whose practice management or billing systems will support that type of billing. We’re struggling a little at the office with physician coverage, as several of our physicians recently relocated with spouses that were finishing medical school or residency and moving on to fellowships or other training programs. We’ve always done our own recruiting, but are thinking about using a firm to broaden our reach. Since primary care physicians are in high demand, I often receive recruiting materials and had to bring in a post card from one recruiter as an example of why we shouldn’t consider using them. Rather than lead with the usual comments about patient volume, procedures, availability of scribe coverage, and hospitalist use, it started with “features two private lakes in a wealthy suburb.” Sure, I’d love to relax by the lake between patients, but I’m thinking it’s more likely that some copy editing is in order. If you’re on the hospital side, CMS will offer a webinar on September 12 covering the Fiscal Year 2018 Inpatient Prospective Payment System (IPPS) Final Rule. This includes clinical quality measures for the Inpatient Quality Reporting (IQR) Program and Medicare/Medicaid EHR Incentive Programs for eligible hospitals and critical access hospitals. It’s difficult to keep up with all the changes to these programs, so having someone help digest the content might be helpful. If you’re on the vendor side, CMS has opened the self-nomination process for vendors who might want to be recognized as a Qualified Clinical Data Registry (QCDR) or as a Qualified Registry. The window closes November 1, 2017 for the 2018 MIPS performance period. Candidates have to not only submit a self-nomination but also must email CMS when their application is ready for review. There is quite an array of registries out there, and I’ll be interested to see what new organizations come to the table and whether they’re offering anything truly unique. Things are starting to pick up in the healthcare IT world, and the user conference season is in full swing. Allscripts hosted its clients in Chicago August 8-10, followed by Aprima, which welcomed its customers August 18-20 in Dallas. Epic will host its clients on-campus September 25-28 with a theme of “World of Wizards.” The EClinicalWorks national conference will be held October 6-9 in Dallas; following that, DocuTAP will hold its User Summit in Nashville October 10-12, overlapping Cerner, which will hold its annual conference October 9-12 in Kansas City. NextGen rounds out the season with its annual user group meeting November 5-8 in Las Vegas. Some year I would love to take a sabbatical from consulting and just go from conference to conference to conference. Pulling off that kind of a feat would require a lot of wardrobe planning and a serious amount of shoes. The other alternative would be to work with my friends at Heelusions to accessorize a pair or two and give them unique looks for the different vendors and events. I’m impressed by their Cerner-specific creation and wonder if anyone will be sporting them in Kansas City. Brand is everything, and this would certainly let employees embrace the company from head to toe (not to mention, it’s rare to see vendor-logo footwear.) 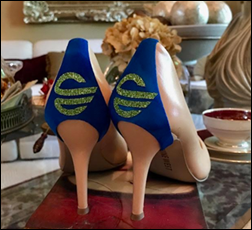 HIMSS is coming, so if you’re looking to take your shoes to the next level, you might want to check them out. What’s your favorite vendor-logo item? What’s the worst you’ve seen? Email me (and of course send pictures)! Interesting background for Sen. Kelley. He seems to be a man that can be honest with the complexity veterans face in the “fog of war”. Have to hand it to him to come forward with the difficult truths our service men and women in combat face in real conflicts. He is different than so many who claim veteran status when they’ve only been a veteran of an air conditioned office and government cafeterias. They served and we should respect them. That said, we need to accept that the VA has a special mission to serve people who might be haunted for life because of what they saw and what they might have done in combat. Compelling article – thank you for sharing. I completely agree about the special mission of the VA – many of the veterans I’ve seen in practice have a number of physical and psychological conditions that interact to create more illness and disability than they would as singular health conditions. These patients deserve the best our country can offer them – they shouldn’t be on waiting lists for basic health services, and they need access to specialized services they can’t always receive from community-based physicians. One of my most memorable patients was a Vietnam-era veteran with life-altering anxiety stemming from his military service. The amount of paperwork, sweat, and tears spent trying to get him the services he needed was unbelievable and the delays were heartbreaking.